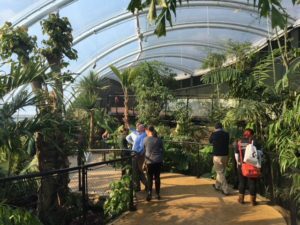 Marwell Zoo in Hampshire unveiled its spectacular new ‘Energy for Life’ Tropical House this week and I attended a preview to experience this sustainable, ground breaking project for myself. Costing £8m to build and constructed using the same state-of-the-art technology as the Eden Project, the new exhibit is housed under a huge curved roof spanning two levels, offering fantastic vantage points across a leafy canopy to the forest below. The magnificent interior is filled with lush green planting, carefully selected from collections around the world, cascading waterfalls and the sight and sound of free-flying birds overhead. The temperature inside hit just over 30 degrees when I visited, a welcome contrast to the low temperature outside. Harvested rainwater provided a brief shower for the plants and animals while I was there, perfectly replicating a rain forest habitat. Looking down to the forest floor below I spotted a Javan chevrotain (mouse deer), a number of tortoises and some brightly coloured beetles and crested birds. A crocodile monitor lizard, leaf-cutter ants and poison frogs can also be identified from the interactive screens available to use at intervals throughout. 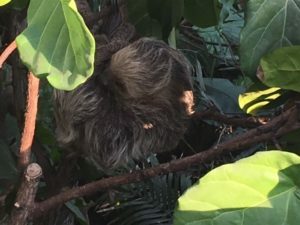 A group of pygmy marmosets were busy exploring their new island home, while the star of the show had to be the beautiful two-toed sloth, a two year old female called Rica, who can easily be spotted close up in the trees. 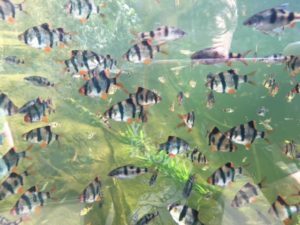 I followed the snaking, wheelchair friendly path round to the impressive 70,000-litre aquarium, where the 2,500 colourful fish contained were absolutely mesmerizing to watch! 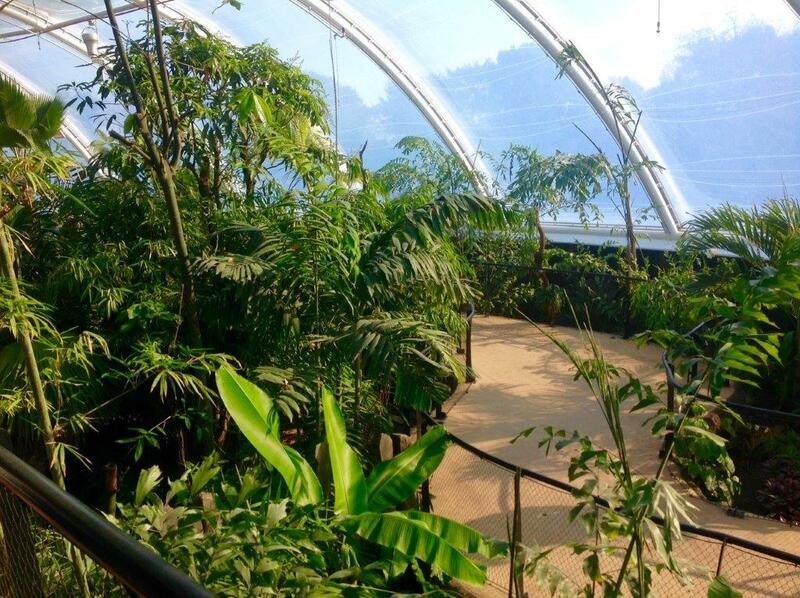 A further room beneath the Tropical House shows how the structure runs sustainably, from recycling animal waste (or ‘zoo poo’) to soiled bedding and leftover hay, converting it into energy to heat the site, with rainwater harvested and recycled too. These efforts will significantly reduce Marwell’s carbon footprint and take the zoo a step closer to becoming carbon neutral by 2020.